Peacocks and pheasants belong to the same family, phaianidae, which also includes turkeys, partridges and grouse. Although in the same family, the peacock (Pavo cristatus), also known as Indian peafowl and the pheasant (Phasianus colchicus) differ in size and color, and live in different parts of the world. Peacocks make their home in India and Sri Lanka, while pheasants inhabit Asia, Europe, North America, Australia, New Zealand and Hawaii. 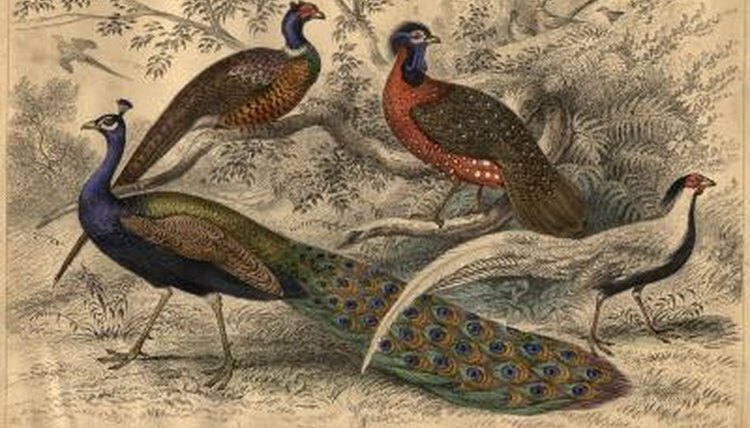 Two noticeable differences between peacocks and pheasants are their color and size, specifically in males. A male peacock displays bright-blue plumage and a blue-crested head, while females are mostly brown with a white underbelly. Another feature of the male peacock is its magnificent, 5-foot train, which makes up 60 percent of the bird’s length. The train consists of more than 100 feathers that each display the peacock’s eye-spot signature. Male and female peacocks weigh close to 9 pounds with a 5-foot wingspan. Although male peacocks are celebrated for their beauty, male pheasants also display stunning colors. Like peacocks, male pheasants are more colorful than the brown-feathered females of both species. Some male pheasants display a bright white ring around their necks, giving them the name, ring-necked. Others feature glossy purple or deep green heads with red-ringed eyes. The feathers on the male pheasant’s body are multicolored. Pheasants are medium-sized birds weighing about 3 pounds with a wingspan of nearly 1 foot. Peacocks prefer living in deciduous forests with readily available water sources and avoid human populated areas. They can survive in cold weather but do not do well in wet, cold areas. Unlike peacocks, pheasants look for farmland, fields and meadows to make their homes. They find shelter under brush, in ditches and under trees. Pheasants can survive in both tropical and temperate climates. The average life span for a peacock is 25 years, while pheasants can live up to 18 years. When it comes to eating, peacocks and pheasants favor the same foods. Their diets consist of insects, worms, invertebrates, seeds, plant material, grains and flowers. The one food peacocks eat that pheasants do not is the juvenile cobra. The mating habits of peacocks and pheasants differ somewhat. Peacocks mate with one female at a time and the female chooses which male she wants to be her mate. She will fight off any other females that approach her chosen mate. The number of eye-spots on the male’s train plays a significant role in the female peacock’s choice. Male pheasants, on the other hand, form a harem of up to 18 females. Female pheasants choose to join the harem, especially with a dominant male displaying ear tufts and a long tail. Male pheasants breed with one female from the harem in early spring. Female peacocks build nests of dry leaves and sticks hidden under low-growing bushes. She lays one brown egg every other day until she has up to five eggs. The eggs hatch after about one month. Female pheasants also build nests but they dig a depression in the ground, lining it with leaves and plants. Like female peacocks, pheasants lay one egg at a time but they lay an egg every day until seven to 15 eggs are in the nest. The eggs hatch in about three to four weeks. Peacock and pheasant chicks have feathers and can walk when born. When Does a Male Mallard Get Its Colored Feathers?